It’s Sunday, and there’s nothing terribly urgent to say, but this weekend won’t let me leave it without writing something. Three weeks into the new year. Good excuse as any to process some stuff. Does it feel longer than three weeks to anyone else? I don’t say that with negative connotations; maybe it just feels long because a lot has happened. Actually, not even that much has happened. But I think I sensed a shift between 2015 and 2016, more than I usually would as the years change. 2015 wasn’t a dud by any means, but nothing really new happened. And I get it. Years will go by in life where nothing really new happens. It’s not bad. But I sense 2016 holds some action. Who really knows what yet. As the year starts to reveal what it will be, I’ve noticed one priority emerge: Keeping better track of everything. Not just physical items, though it would be great if I stopped losing my MetroCards…but ideas, articles, photos, songs – anything that, when I read/hear/see/listen/otherwise consume, immediately catches my eye. If I don’t save it in the moment, I’ll forget to save it at all (or worse, remember it but without the spark of the original inspiration). So far, this is happening in a semi-makeshift way; I’m mostly saving items to a Gmail folder and working to keep better track of them with tags and titles. Not pretty, necessarily, but always with me, easily navigable, and free. I also use Pinterest, tumblr, and the Notes app on my phone. Ideally, I’ll look back on this folder at the end of the year and recall a clear picture of everything that inspired me. “Inspired” may be too strong a word, though I’d say even at this early point there are a few items that fit that bill. Anything that captures how I feel in a moment, enlightens me, makes me smarter, intrigues me, opens me to a new person or idea, provokes me to dance…I want to remember what it was and what it made me feel. Interviews with Elizabeth Banks and Sarah Silverman on Vanity Fair’s “Little Gold Men” podcast. This podcast debuted somewhat recently and I’ve found each episode I’ve listened to extremely insightful. It’s fun to listen to people who love movies and awards season as much as I do – but who actually know what they are talking about, and have informed reasons for thinking this woman will win Best Actress or why the Hollywood Foreign Press will probably give the Golden Globe to this person. Their recent interviews with Elizabeth Banks and Sarah Silverman were particularly notable. The Vanity Fair writers who host ask such precise, revealing questions. I loved Elizabeth Banks talking about two real-life women she has played lately – Melinda Ledbetter Wilson, wife of Brian; and Laura Bush – explaining how she tried to connect to a real-life part of each woman, while understanding she could never 100% “be” them. And the Sarah Silverman conversation; I can’t point to as many specifics, but I found her to be so self-deprecating and smart and loved hearing a first-person account of some of her experiences as an actress. Movies. I haven’t seen as many new films at this point as I would have liked to, but it’s too early to be discouraged. I’ve been underwhelmed with this year’s Oscar season choices (I like anything I saw this summer, from The End of the Tour to Love and Mercy and Trainwreck more than anything from the fall/winter, with the exception of Spotlight) but have at least found a lot to value in The Big Short and Carol. And I’m still excited for the Oscars ceremony. Movies aside, there will be glamour and gossip and people writing the first line of their obituaries. I have recently enjoyed re-watching a couple films – first, Adaptation, which I watched a few years ago. Listening to Charlie Kaufman’s interview on WTF with Marc Maron made me want to revisit it (Kaufman to Maron, about finding the story: “What if I write about me being stuck?”), and I learned a lot viewing the film with that backstory in mind. The second recent re-watch, which I enjoyed just last night with my roommate when we decided we were not going out in any more of this blizzard madness: Guys and Dolls. I watched this movie tons as a kid (I think my mom first showed it to me because my dance class performed to “Bushel and a Peck,” a song from the stage musical which actually isn’t in the film) but hadn’t seen the whole thing in ages. It’s so witty and brilliant, and I never picked up on any of that as a kid. One-liners galore. And I can finally say I understand that the crap game is not literally floating. And with that, there are just a few minutes to Monday, so these Sunday thoughts aren’t worth a lot anymore. But there they are. More to come in 2016. I recently watched The Grand Budapest Hotel for the first time all the way through since I saw it in theaters early last year. I almost think I may have lessened my enthusiasm for the movie as time went on, convincing myself that it was good but not too good, or anywhere near as good as The Royal Tenenbaums. It may not be, but I thoroughly enjoyed the second viewing, and came to appreciate it as its own film, not just as another volume in the Wes Anderson library. This really makes no sense out of context, and I can’t find a clip of this exact moment. But I just thought that was a really beautiful way to describe fate, or whatever force you believe causes events to happen. “Mysterious and utterly reliable.” You never know what will happen, but when whatever happens does happen, it seems to be perfectly timed. Also, as is my wont, I have developed a newfound obsession with an actor in a movie whose performance I enjoyed but who I didn’t know much about. 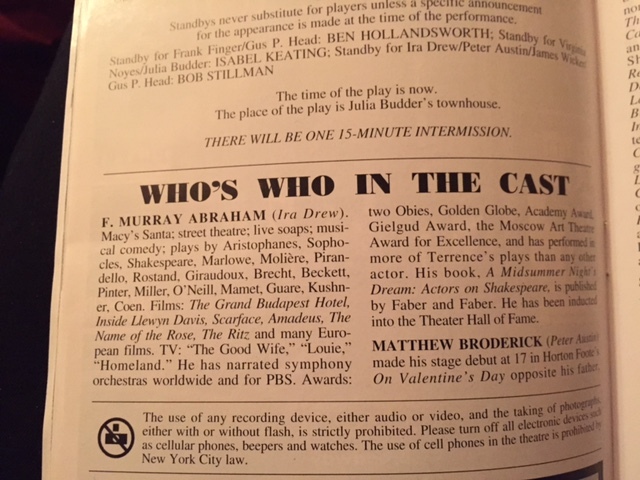 That would be F. Murray Abraham, and I’m working on watching more of his stuff. Though I did already know – because everything in my life has some weird Watergate connection – that he played one of the cops who busts the Watergate burglars in All the President’s Men. One other random movie tidbit: I was so distraught over Oregon’s loss to Ohio State in the college football title game on Monday that all I wanted to do to cheer myself up was watch Juno, so I could reminisce about the role that made me love now-Golden-Globe winner and Oscar nominee J.K. Simmons. Juno is one of my all-time favorites, and while Simmons has a smaller part, he plays it perfectly. You totally buy everything he says and does. He’s a small-town dad who has a simple life but who works hard for his family and knows the little things are the most important. And his wife is played by Allison Janney! The best couple, basically. I love awards season. For some reason all the races and the controversies and the glamour are fascinating to me. And while there’s obviously a fair share of big names nominated this year (and a lot of love for Grand Budapest), I love that J.K. Simmons, the dad from Juno, whom I’ve known of for years because of that role, finally found the role that’s getting him his due.